President Barack Obama is currently enjoying not only a vacation with his family in Hawai'i, but also a "second honeymoon" with the public at large. In fact, his job approval numbers are looking healthier right now than they have since the end of his first "honeymoon" period in 2009. We'll get to all of that in a moment, but first just a reminder that next month will usher in some changes here at ObamaPollWatch.com. We're not exactly sure what's going to change or how it's going to change, but we are diligently exploring how we can improve and update the design of our charts, to begin Obama's second term. Should we only compare Obama to other second-term presidents and just end the charts for all the one-timers? Should we show Obama's numbers on one extended chart, or have separate charts for each term? Should we reset the "highest" and "lowest" numbers for the second term as well? These questions and others are being pondered, so feel free to weigh in with any technical suggestions, in your comments. 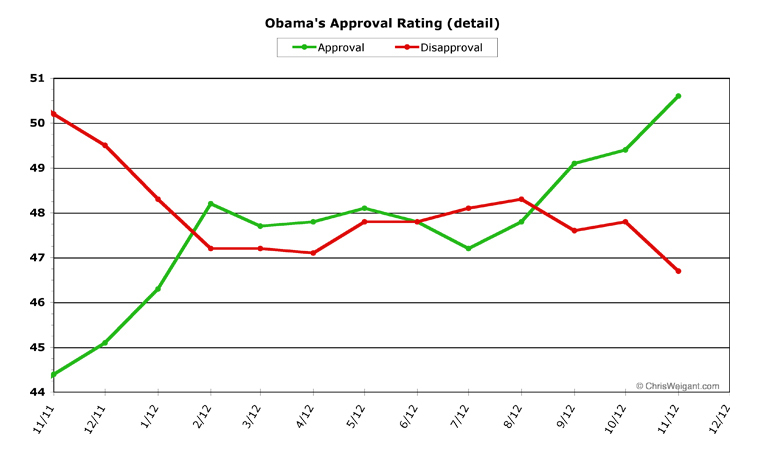 A happy chart indeed for Obama fans. Last month I predicted this rise by noting that many of the nationwide polling operations just ceased polling after the election was over. This dearth of data meant that while Obama's numbers were climbing fast, the "poll of polls" average at RealClearPolitics.com was dragged downwards by pre-election numbers still being averaged in. While I did predict that Obama's numbers would continue to rise in December (as more and more data came in), I will admit that even I was surprised at size of the post-election bump which Obama managed. The raw numbers are impressive. In December, Obama's monthly average job approval hit 53.1 percent, and his disapproval sank to 42.8 percent. Obama capped off a five-month streak of improvement in job approval with a whopping 2.5 percent one-month upward spike -- the third-best month he's ever had as president. The drop in disapproval was even more impressive, changing 3.9 percent to chart the second-best month in this category ever. This is all impressive, but it's more impressive if you disregard the month when Osama Bin Laden was killed and Obama got a short-term "rally 'round the president" spike in approval. Not counting the Bin Laden bump, Obama had his best month ever in changing his disapproval rate, and his second-best ever in improving his approval rate (only January of 2011 was better). Since last August, Obama has improved an overall 5.9 percent in approval -- his longest and best improvement streak yet, as president. For all of 2012 (since December, 2011), Obama has improved an astonishing 8.0 percent. One final detail is worth mentioning -- the "undecided" line is returning to normal, now that the election is over. In October and November, less than three percent were undecided, but this is now back above four percent, and will likely climb a bit more in the next few months (range is normally between 5.0 and 6.0 percent). Side note: This is one change in this column's format which will begin next month -- we're going to stop providing these detail charts for the time being. During the election period, Obama's poll numbers were so stable (and the approval and disapproval were so close to each other) that we found it necessary to explode the scale just to be able to see all the tiny movements in some sort of perspective. But this seems to no longer be necessary, as looking at the full-scale chart easily shows the separation between the two lines as of now. To even show December's data in this level of detail, for instance, we had to change the scale of the detail chart from a low of 44 percent and a high of 51 percent (see last month's chart, for comparison) to the 42-54 percent scale you see above. That was just to fit Obama's December numbers within the boundaries -- which shows that this chart is no longer really necessary. But we did want to provide it as a sort of coda to the election period, to show Obama's second honeymoon bounce in proper perspective. 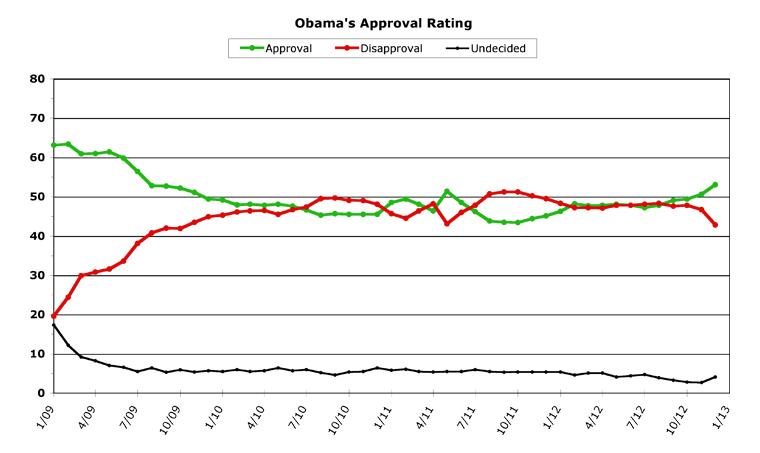 Obama's job approval has risen almost four points in the last two months. That's a pretty impressive trend, but it's one that is likely going to top out soon. Currently, Obama is polling (in individual polls) up to six percent better than the percentage of people who voted for him. That's the "honeymoon effect" of many Americans deciding to give Obama the benefit of the doubt, just after a close-fought election. Which is where a note of caution is indicated. Virtually every president -- whether or not they win re-election -- gets a bounce in job approval polling at the end of their first term. Even one-term presidents such as Gerald R. Ford and George H.W. 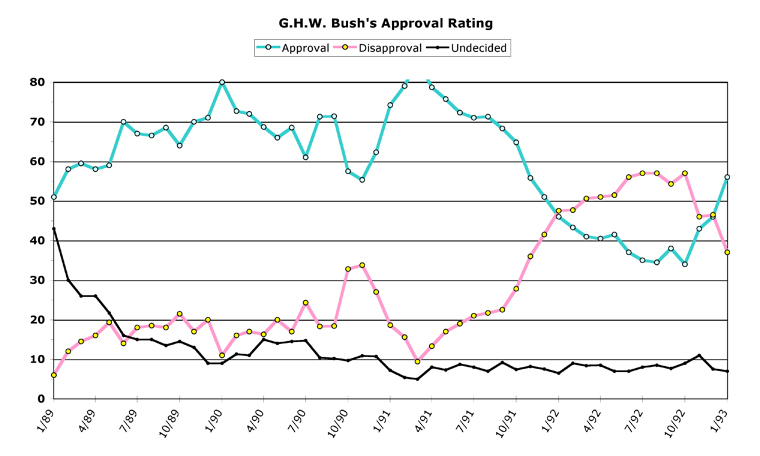 Bush got similar bumps upwards, in fact. So nobody should read too much into Obama's numbers at this particular moment. It all may be illusory, and may be just the public's relief that the election season is finally over. If so, it will fade quickly, and Obama's numbers may sink back down considerably, early next year. Or maybe not. It's a tough month to predict trends for the future, because nobody really knows if the honeymoon numbers will persist or melt away, at this point. 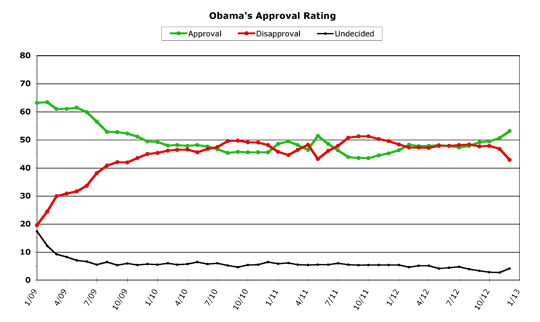 Even with all those caveats in place, things are looking extremely good for Obama. No polling has been done since the fiscal cliff deal was agreed upon, but Obama held his high rankings throughout the December bargaining period. This could indicate that the public already approved of his position, in which case Obama's numbers should hold steady throughout at least January. There could be a backlash when everyone gets their first 2013 paycheck and discovers the "detail" that the media forgot to mention in the whole fiscal cliff debate -- a 2.0 percent Social Security tax hike that will hit every worker. There could even be a backlash against the deal itself, but this is more doubtful. But here's a rosy-tinted look at the next month for Obama fans: his job approval number could quite easily continue to rise throughout the month. There are actually four reasons this could wind up being the case. The first is that all will be quiet along the budget/deficit front for the entire month -- this particular battleground should be a quiet one until roughly February. The second is that Obama will be inaugurated in late January, which will give him a platform to shine before the public. The third is the other big event on every January's calendar -- the State Of The Union address, where (again) Obama will have center stage to himself. But the fourth reason January could be another good month for Obama's job approval comes from his own first-term history. If you discount the Bin Laden bounce in Obama's approval numbers (in May, 2011), there is really only one period where Obama's approval took a sharp upward swing inside of a very short length of time. This was in early 2011 -- right after Obama cut an enormous deal with an outgoing Congress, in fact. Little-remembered now, December of 2010 was a very productive month, legislatively. Obama got "Don't Ask, Don't Tell" repealed, and he won ratification for a nuclear arms limitation treaty from the Senate. He also agreed to extend the Bush tax cuts for two years, but got in exchange the very "payroll tax holiday" that is now expiring. This burst of Washington actually getting something done was seen very positively by the public. 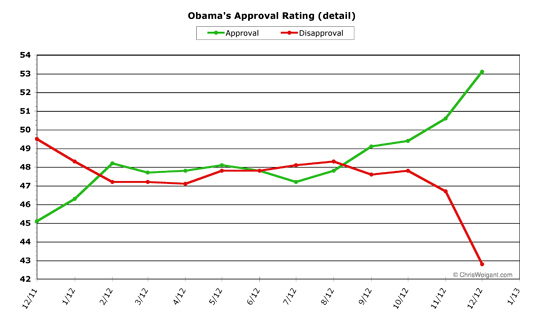 In the space of two months, Obama's job approval went up 3.9 percent, and his disapproval sank 3.6 percent. If history is any guide, the fiscal cliff deal could in fact create another wave of approval on top of the "second honeymoon" bounce Obama is already enjoying. 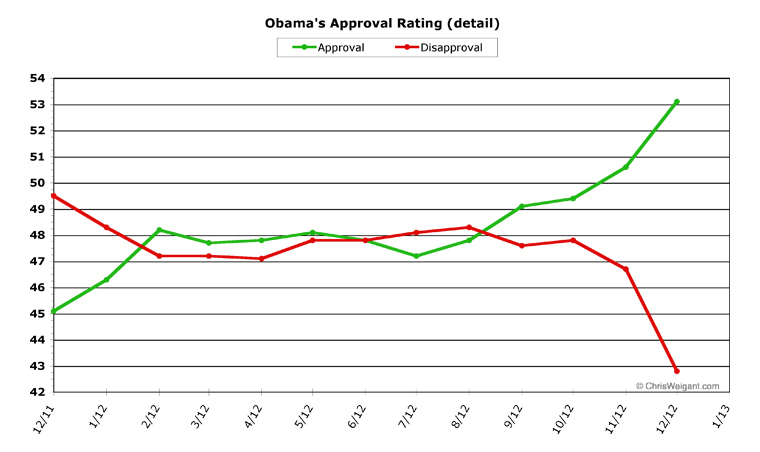 Even if this doesn't appear, Obama should indeed now be enjoying the ratings he is currently getting. To put where Obama now stands into perspective, his numbers now are better than they have been since his first honeymoon period ended, in the summer of 2009. Obama's 53.1 percent average monthly approval is higher than any month since July of that year, in fact -- which includes his Bin Laden bounce (where he only hit 51.4 percent approval) and his early-2011 bounce (where he only got to 49.4 percent). Obama hasn't seen a disapproval rate lower than 43.0 percent since late 2009, and the current "spread" between approval and disapproval is now in double digits, at a 10.3 percent difference -- also better than at any time since the latter half of 2009. It remains to be seen how long Obama's second honeymoon will last (and how high his approval number can get), but so far it's been pretty impressive all around. First off, a big and hearty congratulations on reaching the 2012 goal for the CW.com Holiday Fund Drive! That is really something to crow about. Indeed, it is a feat that should be pointed out when preparing to promote next year's drive - I'll make a mental note of that! I'll bet the folks at PBS are green with envy ... in more ways than one, I hasten to add. Now, if Obama's approval rating is at 53.1%, does that mean that 46.9% find approval with the policies being advocated by the Republican cult of economic failure and foreign policy disaster? OMG! Please make the appropriate edit there for me! Thank-you.